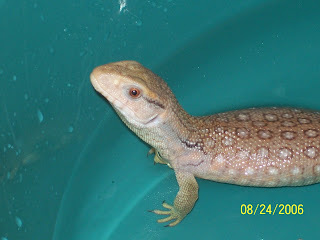 Our Savannah monitor lizard, Calcifer, died yesterday. It has been a hard day for me, he was our first pet together when we were married and had been with us for over 2 years. He wasn't doing very well over the weekend so we took him to the vet and spent a lot of moolah but it looks like there must have been other things wrong as he didn't get better. He was a sweet lizard and will be dearly missed. We buried him up in the hills this morning, I hope he is happy where he is now. I wrote this for him today, I hope you don't mind me putting it on here. It is free verse style, so it doesn't rhyme. the day we got you. the length of my hand. in that first, tiny, apartment. each one bigger than the last.